“Too many American fridges have ultra-processed creamers that are sky-high in sugar and meant to taste like cookies,” says Kristin Kirkpatrick, MS, RD, LD. “They give you a craving for sweet at the start of your day.” This sets you up for feeling hungrier and craving more sweet later on. Flavored creamers may also be packed with trans fats — called “partially hydrogenated oils” on food labels — and calories. “If you can’t eliminate creamers, at least reserve them for very special occasions,” advises Anna Taylor, MS, RD, LD, CDE. Try plain milk, an alternative milk or a nut milk creamer. “For extra flavor, add vanilla, cocoa, cinnamon or cayenne,” suggest Julia Zumpano, RD, LD. Buy flavored coffee beans or add cinnamon to your coffee grounds. Try unsweetened tea. “You may find it more palatable than unsweetened coffee. And with roughly half the caffeine, tea can still get you started in the morning,” says Ms. Taylor. If you decide to add sweetness to your hot beverage, Ms. Zumpano says to limit yourself to 1 teaspoon or less of real maple syrup, organic honey or agave. Ever wonder what keeps stick and tub margarines solid at room temperature? It’s trans fat. “It’s best to replace solid fats with liquid oils, such as extra-virgin olive oil,” advises Ms. Zumpano. 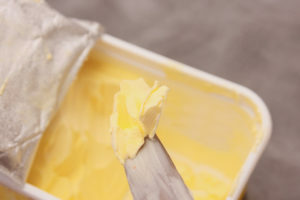 Yet one tablespoon of butter contains about 7 grams of saturated fat — about half the daily limit for most people. “So if you eat butter every day, or multiple times per day, it won’t help your heart or your waistline,” says Ms. Taylor. She likes butter but keeps it in the freezer for occasional use. Natural peanut or almond butter: “Look for one with no trans fat,” says Ms. Taylor. Processed meats are an easy, convenient protein source. But they’re also sources of ingredients you want to avoid — like sodium, saturated fat and additives. “Lunch meats are considered processed because they no longer resemble the animal they came from,” explains Ms. Taylor. We’re not just talking about bologna, salami and pastrami. “Even leaner cuts like turkey and ham are not a good staple for a healthy diet,” she says. Most deli meats are high in sodium, notes Hillary Sullivan, RDN, LD. Hot dogs, bacon and sausage are packed with both sodium and saturated fat. The hormones often found in processed meats may be carcinogenic as well. “Eating just 2 ounces of processed meat per day increases your risk for colorectal cancer by 18 percent,” cautions Ms. Taylor. A healthier option is using poultry or meat from last night’s dinner for sandwiches. “Better yet, try plant-based proteins like hummus and veggie wraps, veggie-laden lentil soup, or an edamame stir fry for lunch,” she suggests. Once you toss those old, scary leftovers out and make your fridge shelves sparkle, consider pitching these foods, too — your whole family will benefit.